Figure 1: Radiance fore-optics of a PRR-800 radiometer.Radiance sensors are easy to identify because they do not typically have a diffuser (Figure 1). In our systems, filtered photodetectors are positioned at the bottom of individual Gershun-style tubes, which restricts the field-of-view to the desired solid angle. Radiance is typically abbreviated with the symbol L.
Different colored filters select the spectral regions of interest. Narrowband ("monochromatic") sensors are equipped with filters that restrict the spectral response to a narrow region, typically 10 nm FWHM (Figure 2). 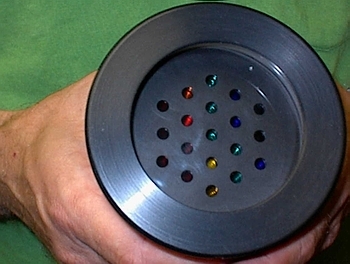 An example of a broadband radiance detector is the natural fluorescence detector (abbreviated LuChl) patented by Biospherical Instruments and used in Natural Fluorometers. To collect as many fluoresced photons as possible, an LuChl detector approximates the emission spectrum of chlorophyll. Figure 2: Examples of spectral response functions of a PRR-800 radiometer plotted on a logaritthmic scale.